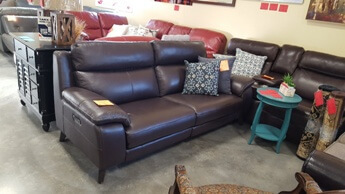 Stylish dark walnut brow sofa features a cushioned back design with plush leather upholstery and a power recliner on each end. Power adjustable headrests as well. High-resilience foam cushions & industrial-strength webbing system.